7c. What's It Made Of? 7g. How Old Is It? 7h. How Much Is It Worth? 7q. I Need Blank Tiles! Notice: All trades or sales are private transactions between individuals--the Exchange is simply a listing point for those who wish to make such trades and is no way involved in any transactions, nor may it be held responsible for any problems. BUYERS & LOOKYLOOS: Just scroll down and read the posts. Know what you want. Read FAQ 7.j. If you see a set you wish to buy or trade for, please contact the seller by email. In February 2014, the U.S. instituted a ban on interstate sale of ivory items, and made it illegal to sell ivory items without a permit that can be obtained only by proving that the items were imported to the U.S. before the 1989 import ban. Consequently, this site no longer accepts any ads for ivory items. SELLERS: Please write us an email describing the set(s) you have to sell or trade. Limit one post per seller (second post will result in deletion of previous post). Please describe your set as completely and accurately as possible. Be sure to note any missing or mismatching tiles. Sellers are advised to be wary of buyers who place large orders, then send a check for considerably more than the purchase amount and want the surplus refund mailed to an alleged friend or relative. The check is no good. Read FAQ 7.n. In February 2014, the U.S. instituted a ban on interstate sale of ivory items, and made it illegal to sell ivory items without a permit that can be obtained only by proving that the items were imported to the U.S. before the 1989 import ban. Consequently, this site no longer accepts any ads for ivory items. Sellers: not sure if your set is ivory? See our What's It Made Of? page for assistance in how to tell ivory from bone. Sellers: EMAIL YOUR ANNOUNCEMENT to Webmaster@Sloperama.com or click the picture below to submit your Set For Sale post. In your email, you must provide a detailed description of the set you are selling (how many tiles, what accessories, overall condition, etc.). Entries that do not provide sufficient information about your set will not be posted. Photos. You may include one photo maximum in your email. If you send more than one, one will be chosen, and it may be shrunk to 400 pixels wide. If you want visitors here to see more than one photo, you should get them hosted online somewhere, and include a link in your email. Click here to learn about how to post photos online, or Google it. No shouting, please. Typing in all capital letters is considered "shouting." If any part of your post is typed in all capital letters, it will be converted to all lower case before going online. No information you provide through this website shall be deemed confidential. Click this picture, or email the address above, to submit your own announcement. Mah-Jongg sellers and buyers take note! There are a lot of scammers out there and they check out boards like this one. Be advised that sometimes your "for sale" post can attract offers from scam artists who offer to buy your stuff (or sell you stuff) but are really trying to rip you off. Click here to see examples of actual scam emails received by the webmaster of this site. And don't fall for scams. We don't knowingly post any scams on these boards, but alert us if you run into any problems. # of tiles:The set has 152 tiles and includes 16 flowers -8 flowers are painted Gold to become Jokers . The Dragons have dragons depicted on the tiles.. There are 4 swirled Bakelite racks in kelly green, light green, orange/red and yellow- Plenty of tokens are included. And all the flippies are fully working. 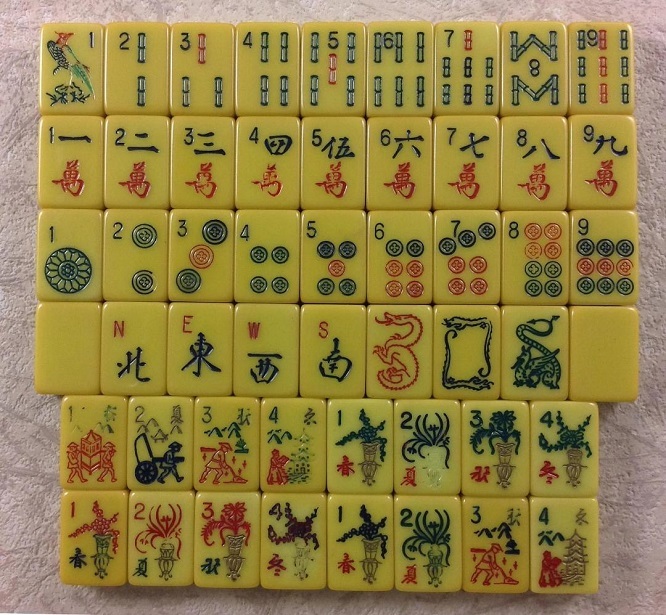 I would like to post a comment, if I may, on the Mah Jongg sets for the visually impaired available in the market today. As you may recall, my firm offered these sets for the first time many years ago long before any other vendor since I have been visually impaired since birth and saw the need for sets that could help those of us who have a problem with the regular tiles. Over the years, we offered different types of sets to help those with visual problems but found some of them too heavy or too cumbersome to carry. Some of our customers were elderly with back problems and some of the sets made it difficult for them to carry their game. Our current set has been overwhelmingly welcomed by customers nationwide because not only are the tiles larger and easier to see but they are thinner and lighter. We use regular racks with the metal ends and a soft burgundy case so the whole set weighs less than 9 lbs. You can view our set at www.funwithmahjongg.com For questions, please call us directly at (561)308-1278 We have customers with macular degeneration and other low vision problems who have successfully used our set. Naturally, we cannot guarantee that everyone who is visually impaired will be able to use the set since the level of impairment varies from person to person. Thanks, Tom and... Have a Great Mah Jongg Day!! >Unique to the special interest, print magazine market is the new quarterly magazine, The Mahjong Collector. 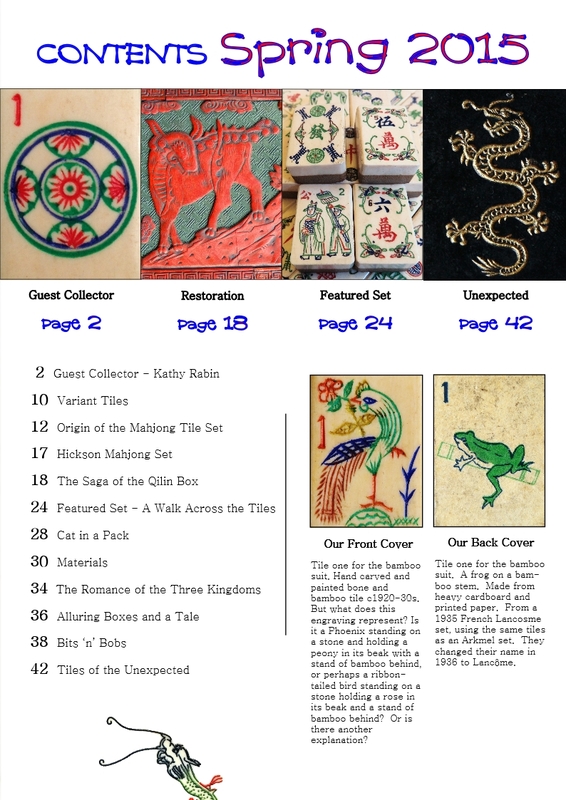 >This publication is unique for it is the only periodical dedicated to a diverse group of people - Mahjong tile set collectors, be they also players, researchers or students of the game. 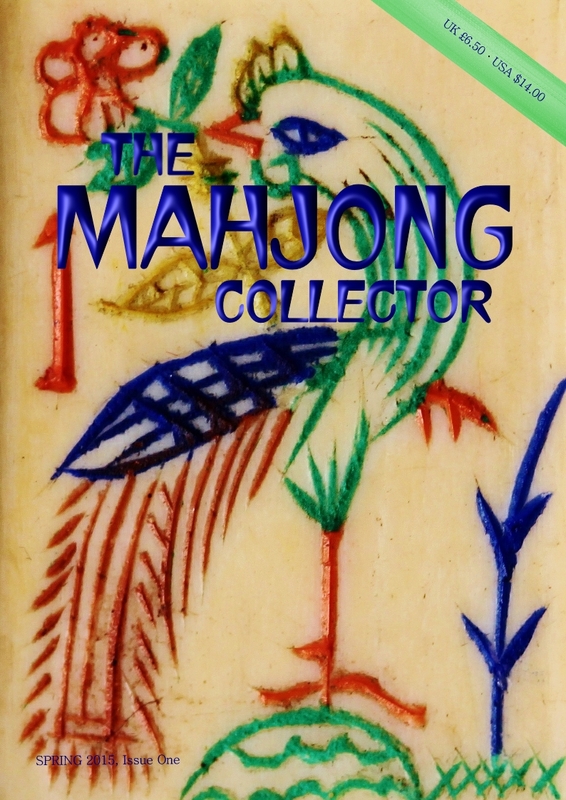 >Published by The Mahjong Collector Company Limited, The Mahjong Collector magazine will be composed of a range of in-depth articles and interviews, accompanied by high quality photographs, in glorious colour, of tile sets found in personal collections and museums. >The authors are drawn from all fields of enquiry and creativity related to the tile set, such as origins, materials, language symbolism, cultural variations and the aesthetics of tile set decorations for example. Creator of the weekly Mah-Jongg column and the Mah-Jongg FAQs -- donations appreciated. Author of "The Red Dragon & The West Wind," the definitive book on Mah-Jongg East & West. To request removal of an outdated post of yours, email "webmaster at sloperama.com". There are several bulletin boards on this site - when requesting removal of your post, please tell us which board your post is on (this is the SETS FOR SALE board).